Captain Pastrengo Rugiati, the last master of the Torrey Canyon was 56 years when he put the 974-foot oil tanker on the Pollard rock of the Seven Stones reef. At the time she was the biggest ship ever to be wrecked; two and a half times the length of a football pitch, and needing about ten times her own length to stop. A Board of Investigation, carried out in Liberia where the ship was registered, concluded that Captain Rugiati alone was responsible for wrecking the Torrey Canyon by his decision to come east of the Scillies, and then to pass between reef and islands, disregarding instructions to mariners from the British Admiralty. 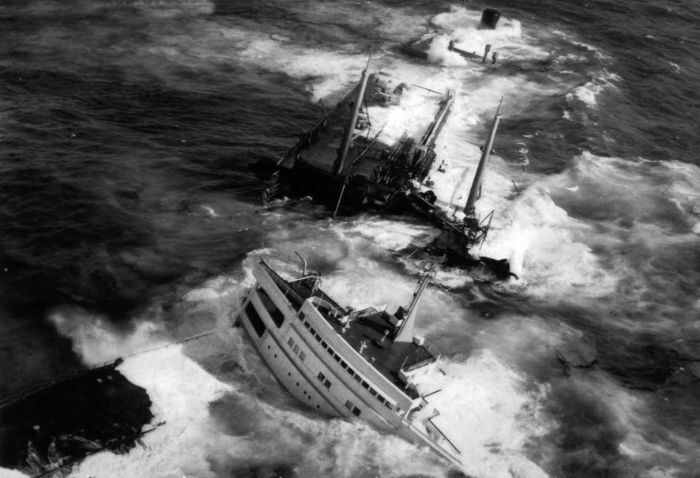 The Torrey Canyon, of 61,263 tons, struck the reef soon after 8.30 am on Saturday March 18 1967. According to the crew she was at full speed when she struck, and a 300-yard-long gash was torn in her hull. The wreck itself was of little significance compared to the cargo of 119,000 tons of crude oil that spewed out into the sea. By Sunday lunchtime it covered an area of 12-miles long by six miles wide, by Sunday night it was estimated that 40,000 tons of the evil-smelling substance had escaped, and by Monday morning the oil slick was estimated to be 22 miles long. As the oil swept shoreward, the stench was blown through towns and villages. One hundred and thirty oiled birds were brought to the Mousehole sanctuary on Sunday, mainly guillemots, razorbills and puffins. Miss Cecily Thomas, standing knee-deep in rags, said that that the bird hospital staff had worked from seven in the morning until nine at night. The fear was that certain species could be wiped out in the South West. Tuesday March 28 was the blackest day for the birds with 557 brought in to the Mousehole bird hospital, and 342 put into the back room of the Beauty Box salon at Perranporth. Spreading detergent on the oil was one of the solutions used. Newlyn was like an invasion port, with no one allowed on the pier except those in the oil-fighting work. The Stevenson trawlers and the long-line fleet and mackerel boats, over 25 in all, were in action spreading detergent. ‘It is a miniature Dunkirk’ said Mr Tom Cotton, Clerk to the Newlyn Harbour Commissioners. There was one major scare. One of the most widely used detergents, BP 1002, was also among the most toxic. Oil and detergents in the sea are cruel killers. Intestines are burned, and lungs frothed over, the birds die in fits. Cornish fishermen feared that the fish would be contaminated. For four days the Pioneer fished the waters close to the Cornish coast to prove that this was not the case. The final solution was to bomb the offending tanker and burn the oil from the sea. On Tuesday 28th March, shortly after 3pm and more than a week after the Torrey Canyon had hit Pollard Rock, eight Buccaneer aircraft dropped four bombs each on the wreck. Despite direct hits and a huge pillar of flame and smoke as the oil began to burn, Torrey Canyon did not sink. The bombing was followed by the dropping over 5,000 gallons of aviation fuel plus large quantities of napalm in an attempt to burn off all the oil. By evening the fire had been dowsed by a high tide and a government spokesman is reported by the BBC to have said, "We have been informed officially that the fire in the wreckage of the Torrey Canyon is out. We cannot say at this stage what the next step will be." Out of ideas and dealing with a situation for which it was completely unprepared the government ordered a continuation of the bombing on 29 March. Torrey Canyon eventually sank and some of the crude was burnt but the attempts to deal with the disaster had proved to be a disaster in their own right. The Seabirds Group of the British Ornithologists' Union estimated that over 30,000 seabirds were killed (Nature, no 215, 9 September 1967 p1123-1125). 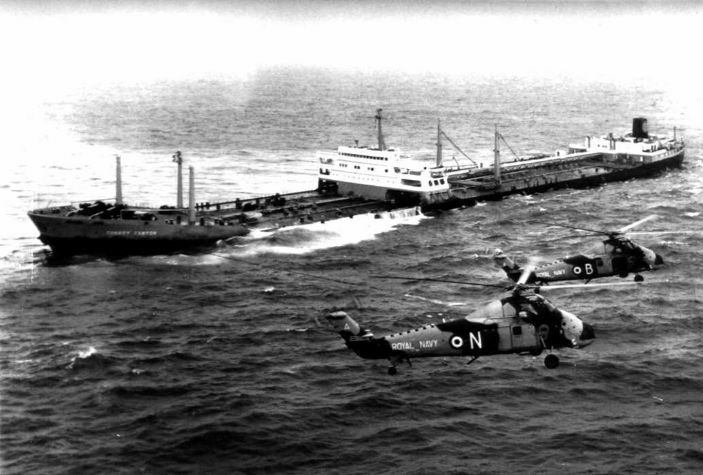 By 29 March 1967 oil pollution stretched from Hartland Point to Start Point and was heading for Normandy. By modern standards Torrey Canyon was small and only 15% of her cargo is estimated to have come ashore in Cornwall - it could have been a lot worse if the south westerlies had been blowing. The Torrey Canyon disaster happened in the public gaze, it was extensively covered by TV and could be seen from the cliffs of West Penwith. It did much to create a climate of environmental awareness while at the same time exposing the total lack of preparedness of shipping companies, cargo owners, regulatory authorities and government. Slowly, and only after further disasters, such as the Exxon Valdez in Alaska in 1989, action was taken to address the deficits but the accidents have continued to happen. The real tragedy of the Torrey Canyon is that we still haven't woken up to the risks. A number of other first hand accounts exist, a selection quotes from local people can be found in the BBC online archive.